Wow was I torn about what session to attend at 12:30 on Thursday. I ended up going this route since I’ve been poking (slowly–every so slowly) at the book Visual Complex Analysis by Tristan Needham, which came highly recommended by a mathematician friend of mine when I voiced wanting to learn more about Complex Analysis. You know a session is pretty awesome when the person sitting behind you lets out a genuine “Holy sh*t!” when he sees the path the presenters have set us on. For those deciphering my color-coding above, blue = Michael Pershan, orange = Max Ray (like that was a choice), and green = everyone else. Except for Ralph, who was also sitting behind me and commented about 40 minutes in that how complex numbers were being built up by the presenters “eliminates thinking about i as a variable”. Because how many of us have had students that do treat it like some unknown thing? i is not a made up number, and this session laid out a compelling argument for students to see why. If you’ve ever had the chance to engage either of these gentlemen in conversation, than you can understand my giddiness at the thoughts of the two of them collaborating. I did some A-E labeling while taking the notes to highlight the major points of the session I was hearing and I’m going to use those in my descriptions below. I’m also going to note that due to my fortunate participation in the Park City Mathematics Institute, some of the ideas shared during the session about i and rotation on the plane are a bit familiar, but the path through all these ideas and how Team M have offered up the unit for free makes me want to go and steal a classroom just so I can have these conversations with students. A. Starting off by expressing a desire for sense-making in math class, Michael set the stage (literally) with a number line taped on the floor and some volunteers to take part in some “coordinate motion”. A visual representation of addition, subtraction, multiplication, and division on a number line. B. What type of language is needed to reconcile the movement of points on a number line with the different mathematical operations? What a neat discussion to get students into after the visual/physical representation of the people on the number line. Michael also made a great point that getting students to cross the wall between these two ideas, arithmetic and motion, takes time. C. I’m staring at my notes for C and questioning if I wrote down ‘rotations’ when I meant something else like ‘transformations’. The word ‘identical’ should also be in there as this was about building up the idea that multiplying by root 5 twice is just like multiplying by 5 once. I like this way of thinking about square roots and I’m curious how it would extend into helping kids think about cube roots or fourth roots. With some new volunteers on the large number line the movement for multiplying by root 5 twice was acted out. Then they switched things up to a natural next step. So far there was a focus on dilations, but what about reflections? Since the volunteers on the number line would crash into one another if they acted out multiplying by a negative trying to get past one another while staying on the number line, this built a case for thinking about multiplying by a negative as a circular rotation about the 0 mark. Making two identical rotations that result in, say, the 180 degree rotation that multiplying by -1 would cause something like my circle doodle near the top left to happen, which is what the volunteers on stage ended up doing. When actual students were doing this and they had to pause after the first ‘step’ of the 180 degree rotation (so they were 90 degrees off from the start) I cannot put enough hearts near Max’s retelling of a student who commented “if we had a y-axis, I could tell you where I am.” Oh hai, complex plane. How lovely to meet you. Of course you are a sensible thing to have here. 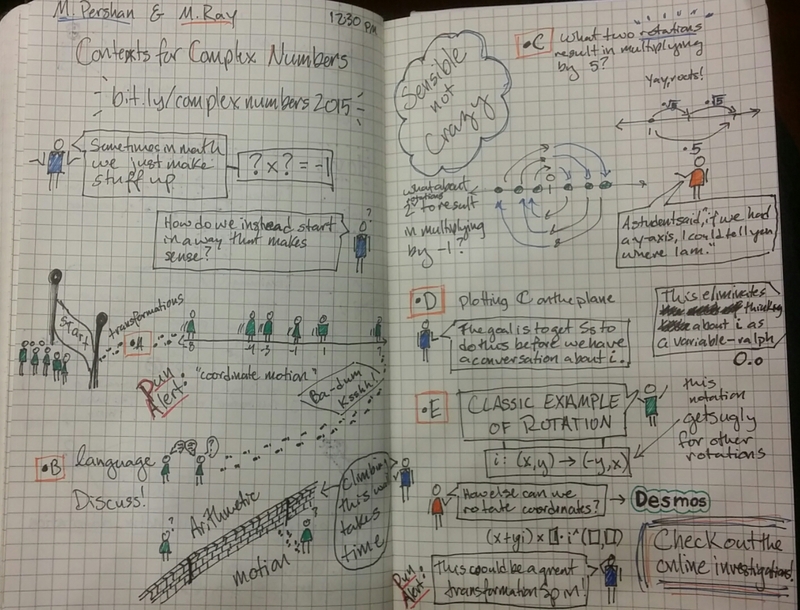 If that doesn’t make you stop and think and marvel a bit and how lovely the mapping makes complex numbers a thing you would want then you are reading the wrong blog post. E. this is actually a quote from student work that Michael shared that the room thought was adorable. Max then provided an excellent mental chaser with the work he’s been doing in Desmos to make the complex plane a thing there. If you want a place to start, try Investigation 1. There is even a ‘hints’ section, which I suspect got some inspiration from Michael’s theme at Shadowcon. Bonus fun: the next morning while walking to a session I passed some folks who were at this session and they were still discussing it. Well done, Team M, and getting people thinking and discussing this neat topic. An excellent session. Bonus fun part 2: Bob Lochel was also there and had some thoughts that he shared over on his blog.